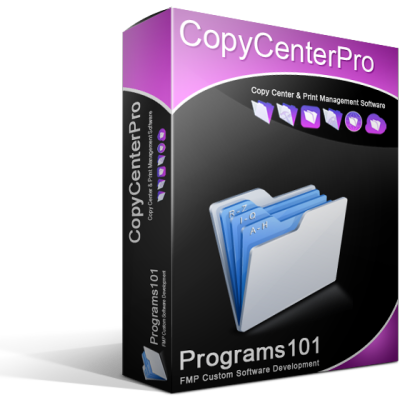 CopyCenterPro is a professional copy and print center management software package created specifically for the unique demands of organizations who take advantage of centralized copy machines or a dedicated copy center. 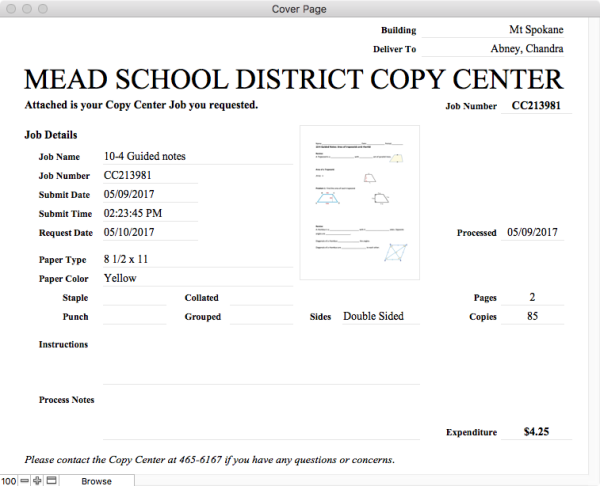 Developed for school districts ... CopyCenterPro provides teachers and staff a complete solution to their printing and copying requirements ... saving schools thousands of dollars per year. CopyCenterPro is an indispensable print job request and copy center fulfillment software program designed to make order entry and print job processing exceptionally fast and easy. There is nothing for teachers to download and no training is required ... just the ability to use a standard web browser from any computer. CopyCenterPro software is unmatched for clarity and ease of use ... customization, training and tech support are included. 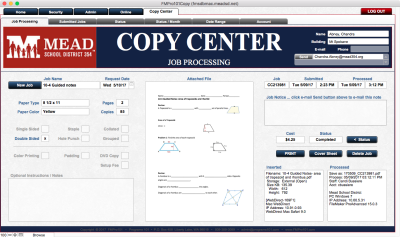 CopyCenterPro simplifies print job requests for teachers and staff. There are no submission forms to print or send and no e-mails required … just a few clicks on a web page and the copy center has the order. The system is highly intuitive and user friendly so no training is required. 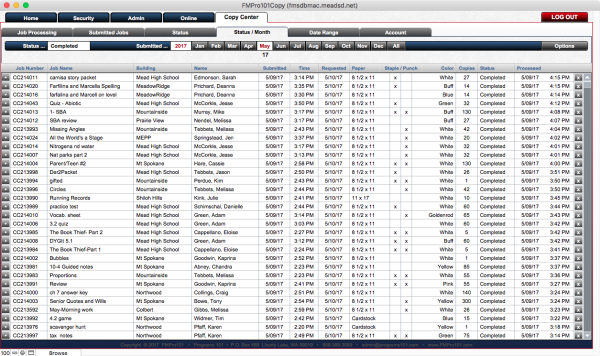 Buttons are highlighted in sequence to help guide them through a simple print job request. Entering print options is foolproof and print jobs are only submitted after all required fields are entered. 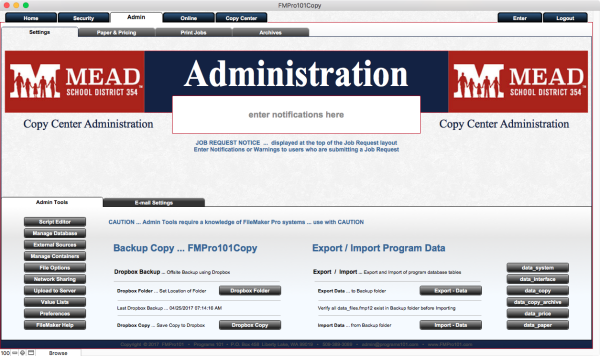 Notices are written in plain english to help teachers complete their job requests quickly and easily. 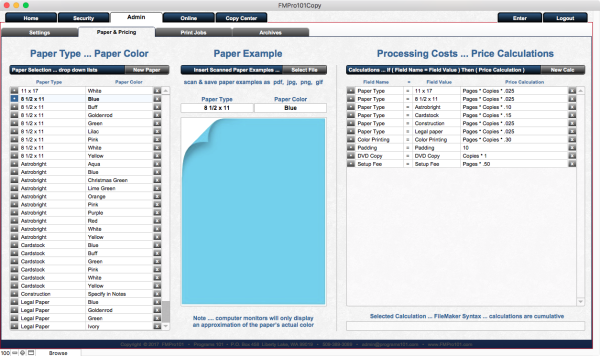 Even example images of the available paper colors are displayed to help prevent mistakes ... it just couldn't be simpler. The entire submission and processing is completed in just a few minutes. Teachers select print options and attach their file to be printed ... the copy center receives the print request in real time and can begin processing immediately upon submission. The copy center staff selects from a list of submissions which are color coded as being ready to print or already in process by another staff member. With just one click the attached file is opened for processing and sent to the copy machine's print driver. After completing the job the program prints a cover page, archives the attached file and automatically emails the teacher that their print request is completed. 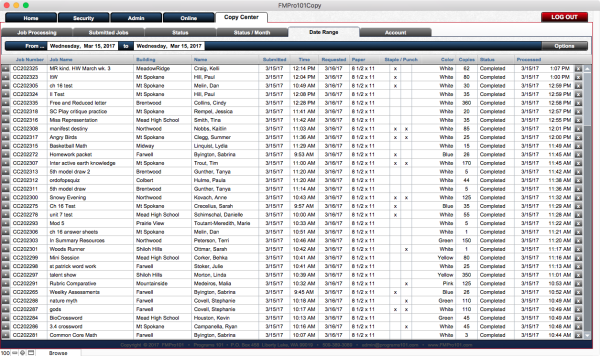 CopyCenterPro provides quick access to current and past print jobs by completion status, month, date range and teacher's login account. A complete administrative section manages both staff and user login accounts, email server settings, general notices, processing cost calculations, print paper styles, scanned examples of paper colors, job archiving, reports, and document storage. CopyCenterPro includes FREE setup and is customized to match your school colors and logo ... tech support, maintenance and periodic updates are also included. 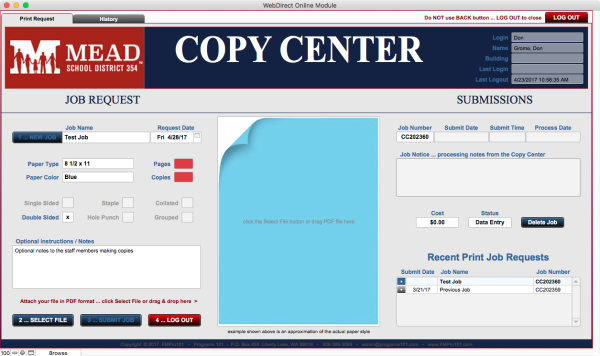 CopyCenterPro is fully customizable and can be modified to fit your specific needs. Any number of fields, options and unique functions can be added and the built in operations can be molded around your work flow to streamline your production. The program is formatted to fit your school colors, logo and overall style and includes a custom Home page which can be linked with your website. CopyCenterPro options include a new Apple Server with 3.5 GHz 6-Core processor, 16 GB memory and 256 GB flash storage drive. Configuable up to 12-Core processor, 64 GB memory, 1 TB flash storage drive and Sonnet rackmount enclosure. Supporting software includes FileMaker Server and FileMaker Pro Advanced annual license with a discount off regular pricing. Annual license will be custom configured for your specific needs based on your staff and web access requirements. "​CopyCenterPro saves our school district from $100,000 to $200,000 per year." "Before CopyCenterPro and our centralized copy center … we needed a para-educator and a large copy machine in each of the 14 schools … but now just a small machine each and no staff. So we went from having 14 large machines and 14 full time para-educators to just 3 machines and 3 para-educators in our centralized copy center. 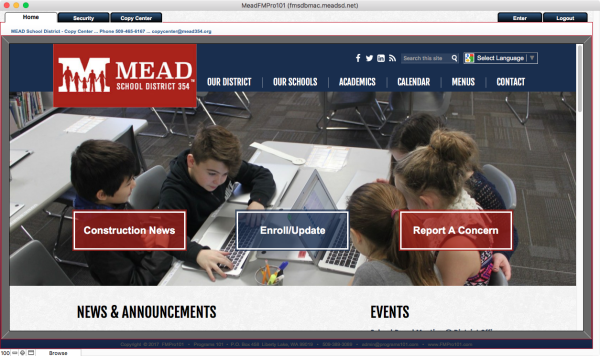 The savings to the district is immense … and the quality of our printing has gone way up." "Because the para-educators are now dedicated to just running the copy machines … they have become full time professionals and the quality of our printing shows it. We can make better use of the facilities and the machine’s capabilities so we now even make booklets and other extras that we previously sent out. There’s also a large reduction in waste and much better management of supplies and inventory. Everything is under one roof so it’s much easier to manage." "Centralizing our copy center has made the biggest impact … but the CopyCenterPro software is what made that possible. 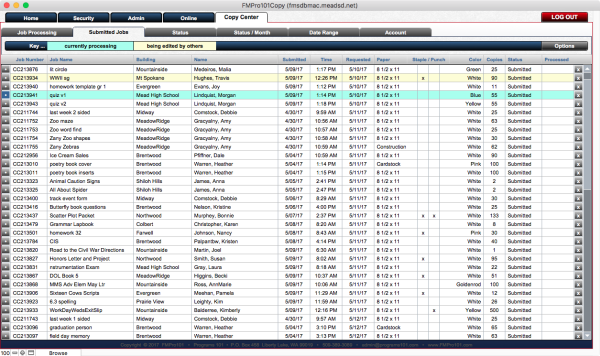 CopyCenterPro allows the teachers to access the copy center from any location and drastically reduced the time spent making copies. We find much of the time teachers submit their printing requests from home … Sunday evening being their favorite time. The copy center has the submission time and the requested completion so the staff can coordinate how and when the jobs are completed and delivered. We have our regular drivers deliver the print jobs to each of the schools along with their normal deliveries." "In our administration office we can track individual teacher’s printing and costs and run financial reports from the program. We can also set notices for all teachers when they login which saves us sending out mass e-mails for print related issues. 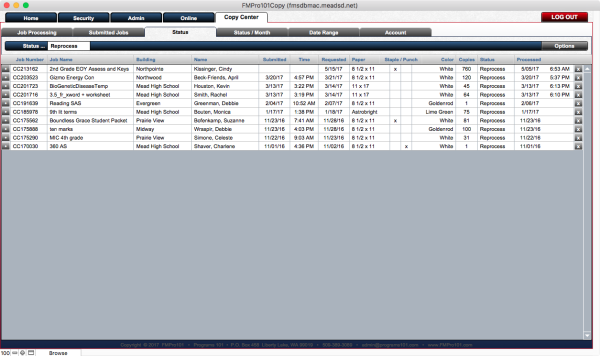 We can even manage the teachers login accounts and see when they last used the program and how long they were on."